Money matters? Perspectives on Monetary Policy: From firmly to weakly anchored, or the importance of an adverb! Four months ago I published a post with the title: Is the price stability target of the ECB at risk? In it I explored the risk of inflation remaining too low for too long in the €-area. My conclusion was: ”yes, there is a risk for the price stability objective, but the probability of this unfavourable development is low if the ECB will use its tools appropriately.” In light of the lack of action by the ECB in March, even when projecting inflation remaining well below its objective of “close but below 2.0% in the medium run” for the fourth year, it is useful to review the issue and update the answer. My conclusion this time can be summarised in an adverb: the President of the ECB re-stated in his press conference in March that inflationary expectations are firmly anchored , my own reading of the available evidence is that inflationary expectations are only weakly anchored. This, considered jointly with the lack of action as well as with the lack of any report on the side of Draghi of a discussion in the last Council about possible moves, is a source of concern. iii. Forecasts/projections of international organizations. The three sources are examined in turn. i. 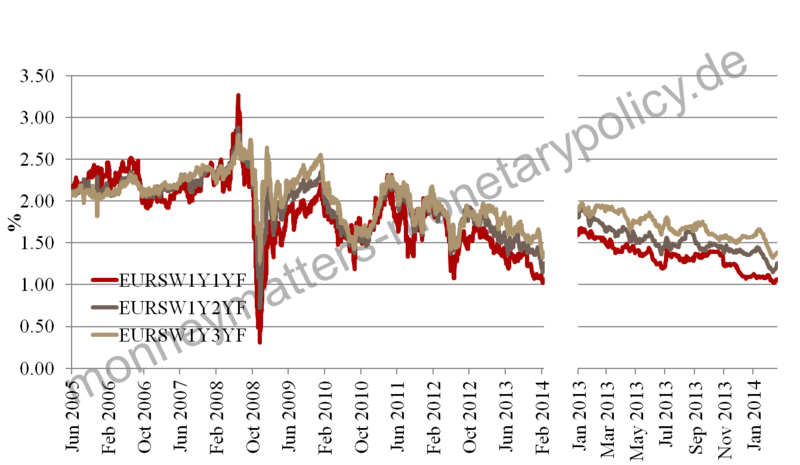 The break-even inflation derived from protected/straight bonds or inflation swaps shows a different behaviour between the short to medium term and the long one. The 10 year ahead break even inflation (Charts 1) shows, using both German and French bonds, a clear move away from 2.0 and towards 1.5% since autumn of last year. 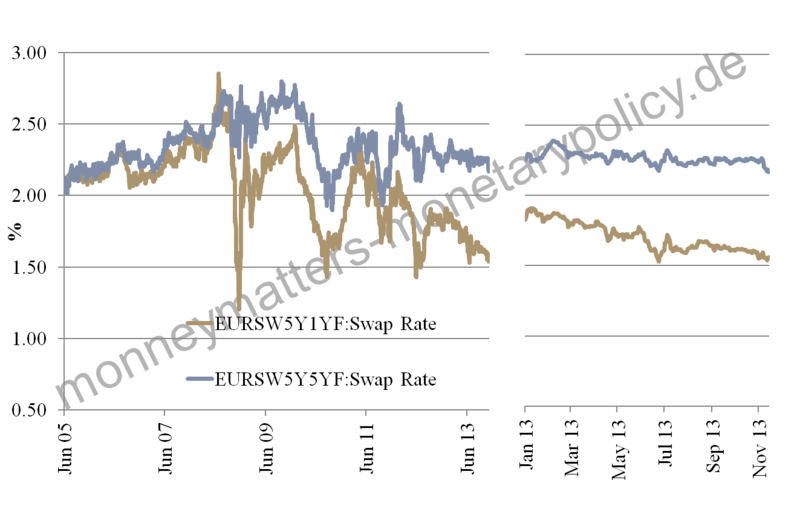 The move is even clearer over shorter horizons as the one-year inflation 1, 2 and 3 year forward (Charts 2) has moved to a range between 1.0 and 1.5%. It is only in the longer time horizon, specifically on the 5 years 5 years forward year break even inflation (Charts 3), that one finds expectations consistent with the 2.0% objective. This is the preferred ECB gauge of inflationary expectations, but one has to stretch into the long term the definition of the relevant time horizon over which the inflation objective has to be respected to say that break-even inflation is still consistent with the ECB objective. A broadly similar message emerges from looking at inflation forecasts on the right panel of table 1 where there are the forecasts of Consensus Economics on inflation and labour costs. What is most relevant is that, net of productivity, labour costs are forecast to hover around 1.0% for the foreseeable future, and indeed beyond what can be foreseen with any degree of accuracy. 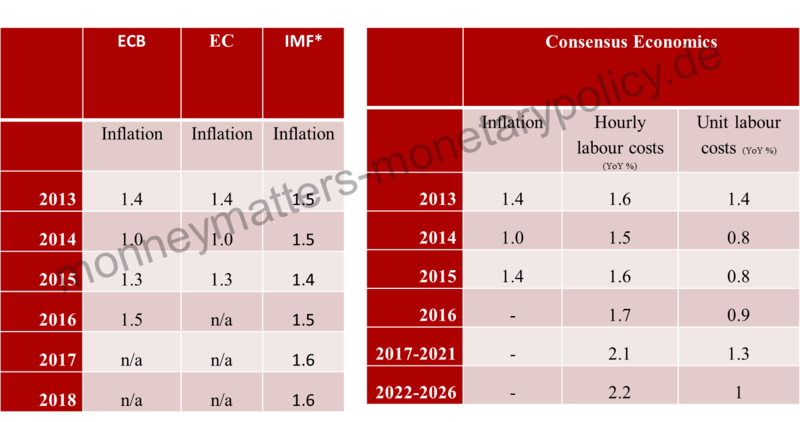 The left panel of table 1 reports ECB, European Commission and IMF forecasts/projections for inflation, which do not show, also because of the medium time horizon, a clear return to the 2% objective. 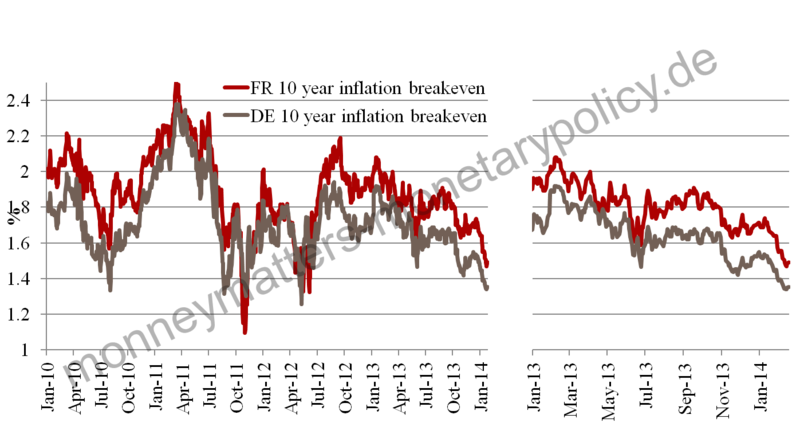 My joint reading of the breakeven inflation, the pooled forecasts and the forecast of international organizations is that inflation is only expected to go back to the ECB objective of 2.0% in the long run. This is hardly reassuring, however, as the further into the future forecasts go the larger is the forecasting error. In conclusion expectations are consistent with the 2.0% ECB objective only for the long maturity, which is the one for which we have most uncertainty. First, it is not clear to me that forecasts of inflation around 2.0% in 2017 or 2018 are consistent with a rate of unemployment still close to 12.0 percent in 2015 and 10.0 in 2018 (according to professional forecasters): shouldn't the economic slack manifested by such a high unemployment rate exert a stronger deflationary pressure on prices? Second, price and wage developments, as well as inflation projections, are close to deflation in the periphery of the €-area while they are far from it in the core. This difference is, of course, needed to remedy the competitiveness gap between the two parts of the €-area and is consistent with their different output gaps, but introduces another element of uncertainty: will the aggregate €-area development be attracted by the situation in the core or by that in the periphery? This question gets somewhat more worrying, considering that even in Germany, with a very low unemployment rate (less than 6.0%), wages are growing at a lacklustre 2.5%. Corrected for productivity and inflation, this gives a negative figure, which means that income distribution is moving further in favour of profits, when just the contrary would be needed to increase consumption in Germany and thus help reduce its mammoth current account surplus . In conclusion, the developments of inflation prospects between the Autumn of last year and the most recent data justify a more concerned assessment than the one I expressed four months ago. Having weakly rather than firmly anchored inflationary expectations would have justified some action to fortify them on the occasion of the last ECB Governing Council meeting. Instead, if we take exchange rate movements as an indicator of inflationary expectations, the strengthening of the € which followed the press conference in March shows that, instead, the lack of action from the ECB has further weakened the anchoring of inflation. *** Madalina Norocea gave assistance in preparing this post. Should German workers be paid more? Or, Do we have an omitted variable bias?